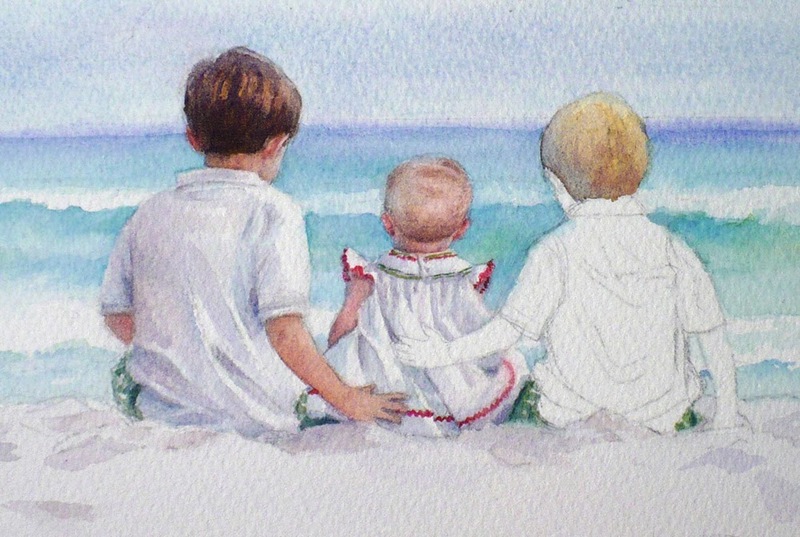 Today I finished a custom watercolor painting of three children. I don't yet know what the name of it will be. I'll let the client decide! 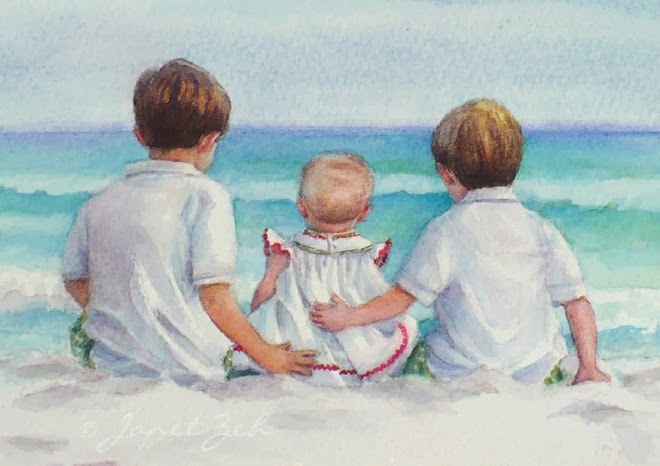 She sent me a few photos of her children on a beautiful beach in Destin, Florida where her family has vacationed for 37 years. She wanted them shown from behind sitting in the sand and looking out at the water. To the left is a small study I did before beginning the 8x10 watercolor. I will change the position of the boy on the left a bit. Otherwise, I'll use this composition. Read on to see how I paint this scene. 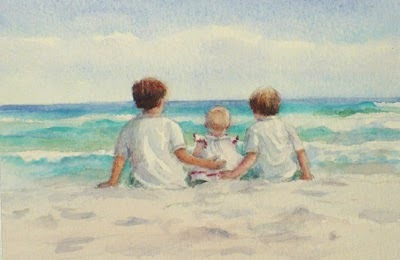 Or click here to skip to the finished watercolor. 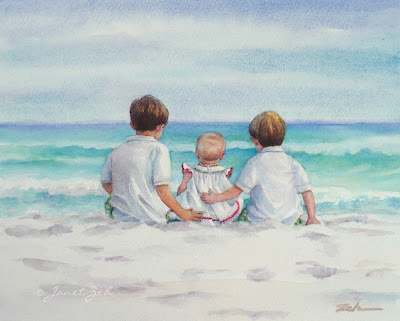 First I paint the sky, then I wash in blues and turquoise colors for the water leaving the surf white. I love using cobalt turquoise hue for painting tropical ocean scenes. Next I paint the boy sitting on the left. I will add more details to his shirt when I work on the other children. Then I paint the sand. 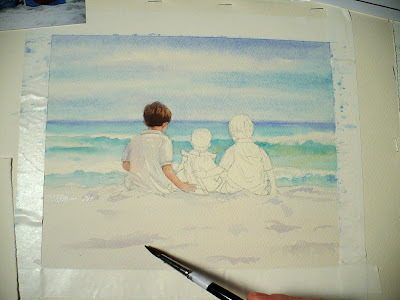 The sand is so white, I have to use a very pale wash of color. But it is not perfectly smooth, so I paint shadows to show the uneven surface. Once 've finished painting the blond-haired baby (doesn't she look like a little princess? 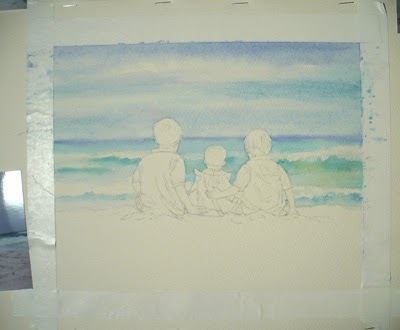 ), I begin the boy on the right. His hair is lighter than his brother's. His skin is paler as well, so I will need to use a pinker color. Below is a close-up of the three children. 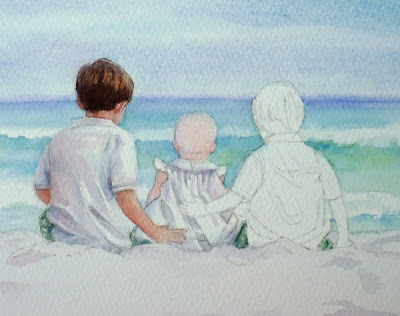 Won't this make a perfect Christmas gift for their dad?